Hi all, how are you today? I hope you are wonderful. 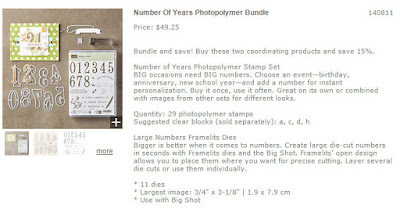 Today is a quick post using the Number of Years stamp set and coordinating framelits. I am in LOVE with the bundle. If you purchase this as a bundle, rather then each item individually, you can save 15%. This can be found in the Occasion Catalog right now. The awesome DSP that I used is also in the Occasion Catalog right now and is called It's My Party. This a 12 x 12 DSP paper pack that has a ton of different designs, all totally awesome!! !